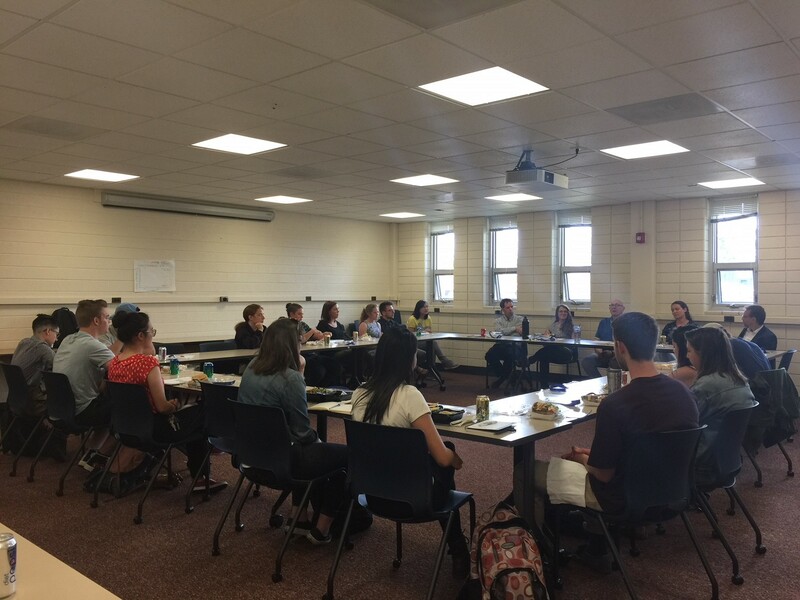 On May 11, Alumni Engagement, Career & Professional Development, and the Department of Geography & the Environment came together to host a Dine & Dialogue on Careers in Geography. Five alumni from across Environmental Science and Geography – from brand-new to retired professionals – joined 16 students to share insight on industry trends, networking in the field, and finding a job in sustainability and GIS. It was a great conversation; the event organizers truly enjoyed seeing the students stick around after the Dine & Dialogue to mingle with our alumni volunteers. It was exciting to witness nuggets of insight and business cards being exchanged! For those of you who were unable to join us, here are three main takeaways from our discussion. 2. You don’t have to be a Geography major to break into the industry. Anyone who enjoys complex problem solving, advanced mathematical modeling and/or applied mathematics, economic modeling and valuation, environmental social impact assessments, or coding (particularly R or Python) would be a great fit for GIS. Whether you are studying Business Information & Analytics, Computer Science, Economics, Mathematics, Physics, or something else, you should be able to find your niche if you can market your skills through the lens of the problems and industry trends in GIS. Since GIS is an ever-changing field, the alumni stressed the importance of staying current with industry trends no matter your program of study. 3. While continuing your education could be an asset, you do not have to jump into a graduate program right away. Much of the Dine & Dialogue centered around the important question of whether or not someone interested in GIS or sustainability should have a Master’s degree or higher. While the alumni volunteers agreed that graduate study teaches students how to conduct research, write well, and think critically, it is not necessarily essential to finding a job in the industry. Lauren Duncan, who serves as Abandoned Mine Restoration Project Manager at Trout Unlimited, encouraged students to not pursue graduate study “just to go,” but rather to first become familiar with working in the field, investigating knowledge gaps, and determining their goals for graduate study before applying. While on the job, however, be sure to take advantage of the opportunities that arise to become knowledgeable in specific content areas. This is a great strategy for advancing your career before deciding on continuing your education. It was so great to host our five alumni volunteers and we hope to bring together more students and alumni from a number of programs and majors in 2018-19!